When encountering a homeless person, it’s often hard to know the best way to help. While giving up some small change can provide short-term assistance — helping them get a hot meal or raise funds for shelter — these donations are unlikely to help them get off the streets. Now the WeShelter app is using mobile technology to truly empower pedestrians in alleviating homelessness. The app is designed to let users easily inform outreach teams about homeless persons when they spot them. Users simply have to download the app and tap a green button — one of the organization’s corporate partners will then automatically make a donation of approximately USD 0.05. The button can be tapped anytime, but users are encouraged to act particularly when they come across someone in need of help, as this matches the donation with a request for assistance from homeless outreach services. WeShelter passes any information to a local homeless service orgazination, who can then attempt to provide real-time help. If activity on the app grows significantly, WeShelter will also be able to use the crowdsourced location data to help New York City’s Department of Homeless Services manage their resources and prioritize areas in the city that are most in need. Users can increase the donation value up to 500 percent by sharing messages from the app on social media. WeShelter is currently seeking nonprofit status from the IRS and aims to pass on 90 percent of donations, keeping 10 percent for operational costs. 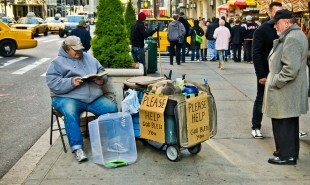 How else could people use technology to come to the aid of homeless individuals?